The locally assembled Volkswagen family car is now available in showrooms. Motor dealer DT Dobie on Friday stepped up its bid to wrest market share from used car sellers who account for about 80 per cent of total vehicle sales by touting the new vehicle as a better alternative to used, imported cars. “The recently introduced Volkswagen Polo Vivo five-door hatchback is an attractive and cost effective alternative to buying a used car and brings new car ownership in reach of many more Kenyans. The Polo Vivo is on sale now starting at Sh1.65 million and is displayed at the DT Dobie showroom in Lusaka Road, Nairobi,” said the auto dealer in a statement. The dealer had not answered our queries on the total units produced and sold so far by the time of going to press. 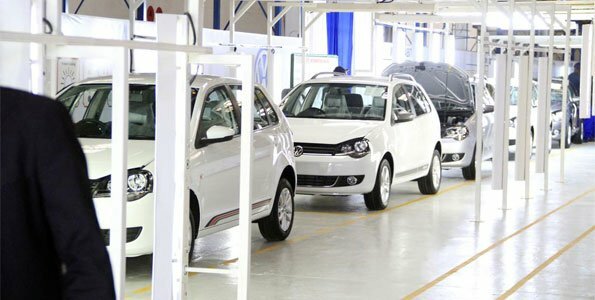 The Thika-based assembly plant— in which the Kenya government has a 35 per cent stake– has set a target to assemble 1,000 cars annually from January. The car comes with a warranty of three years, or the equivalent of 120,000 kilometres. Additionally, buyers can sign up for the Sh99,000 three-year service plan, which is equivalent to Sh2,750 per month. “By purchasing a new Volkswagen Polo Vivo the owners are spared the worries of buyers of used cars which are often unsuited for Kenya roads and tend to require frequent repairs… there is the satisfaction of knowing that the Polo Vivo will have to be driven for four, or five years before it has reached the mileage of a used imported car,” it said. Buyers will have the option of finance schemes and the purchase involves paying monthly installments over four years, said the dealer. Thika-assembled VW family car hits DT Dobie showrooms Reviewed by samrack on February 7, 2017 .